GRTS is located in Chillicothe, Missouri, a rural community of 10,000 people. We are in North Central Missouri about 70 miles from St. Joseph, 120 miles from Des Moines, 90 miles from Kansas City, and 240 miles from St. Louis. We are close to many modern industries and employment opportunities for our graduates. The community provides strong support for the school and its students with private housing and part-time jobs. Your application for admission will be reviewed individually. You should make a point to visit the school where you can meet with our vocational counselor, financial aid administrator, faculty members from your area of interest, and receive a tour of the school. Contact us via email, phone, or stop by. Technical careers account for over 70% of the jobs in this country. Employers are ready for you to complete your training and choose from many career opportunities. Check out the listing of programs below. 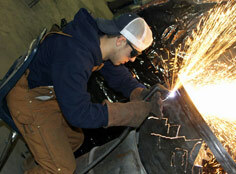 Industrial Welding Project Lead the Way Engineering Hospitality & Tourism Mgmt. Most complete in one school year, beginning in August and finishing in May. Classes meet for six hours per day for a total of 1,080 hours. The programs include paid internships to help you get a jump start in your career area. Programs are certified by national industry certification organizations to ensure modern curriculum as specified by industry standards. Compare our school to others or visit a top industry, and you will find that the GRTS has the most modern, up-to-date equipment available. When you graduate, you will be trained and ready for employment in the best jobs available. The GRTS campus consists of classroom and shops/labs for each program and also includes an on-site preschool and child care center for those students needing child care services for their children while they attend school. Grand River Tech also maintains the Litton Agri-Science Center where its entire agriculture program is housed. Your instructors have extensive work experience in the career field they teach. The instructor's industry work experience is important to you. You won't be bored by theory, but will receive a practical, hands-on education that is demanded by your employers. All programs have industry advisory committees who evaluate and recommend the necessary curriculum for proper preparation for a successful career. Our mission is to prepare you for a successful, rewarding career. Don't make a career out of going to school - choose a school that prepares you for a career. We won't waste your time. We'll give you the necessary career skills as efficiently as possible and help you move into your career or on to additional post-secondary training. Evaluate and visit our programs before you enroll, and when you start, give us your best! You enroll at GRTS to develop the skills required for a successful career of your choise. We will do our part to create employment opportunities for you, and we provide a full-time career placement service for all graduates and former students anytime. A job bank of available part-time jobs is maintained while you are in a school. Click here to view our most recent Placement Charts. Students who attend courses at Grand River Technical School, have the opportunity to earn articulated college credit. Articulated credit offers students a way to save money and time completing an Associate in Applied Science degree. Grand River Technical School works with the following colleges to award articulated college credit: North Central Missouri College; Metropolitan Community Colleges; Linn State Technical College; State Fair Community College. For a complete list of programs and credit hours, visit our Articulation page. For more information on the Associate of Applied Science (AAS) Degree from North Central Missouri College, click here! GRTS provides services and encourages enrollment by special populations including non-traditional students, dislocated workers, single parents, and displaced homemakers. Supplemental financial aid is available to students who qualify. Students desiring to reside in Chillicothe will find available rooms or apartments. Even though the school does not have a dormitory, school personnel will assist you in locating suitable housing. In addition, approximately 90% of GRTS students receive financial assistance. Several types of financial aid are available at GRTS. These include various grants, which do not require repayment, and scholarships, through sources such as PELL grant, Workforce Investment Act, Veteran's Administration, Vocational Rehabilitation, New Traditions, A+ Schools, and Institutional scholarships. To be eligible for financial assistance, you must complete and submit a Free Application for Federal Student Aid (FAFSA). The priority date for this form is April 1 for fall enrollment. GRTS financial aid code is 005531. For information concerning application procedures, contact the Financial Aid Administrator. For tuition information, click here. Download our Adult Admissions Policy and Financial Aid Handbook as an Adobe PDF file. Quality child care, licensed by the Department of Health, and accredited by Missouri Accreditation and the Department of Elementary & Secondary Education, is available on campus for your children while you attend school. Grand River Technical School opened its doors in 1967, operating at that time under the name "Chillicothe Area Vocational-Technical School." A new addition was added in 1973. On July 1, 1995, the name of the school was changed to Grand River Technical School to more properly reflect the "area" concept of the school's territory. Since opening, there have only been four directors, including the current director. They were as follows: Roder Nyberg: 1967-1989; Ron Wolf: 1989-2013; Roger Wolf (Co-director): 2004-2013; and Jayme Caughron: 2013-present (Assistant Director from 2004-2013). At one time (1984-85), all four of these individuals were actually at the technical school at the same time - Roder Nyberg as director; Ron Wolf as assistant director; Roger Wolf as Agriculture instructor; and Jayme (Bannan) Caughron as a Business student. The school provides needed technical training programs for secondary students, post-secondary students, and adults. It is accredited by Council on Occupational Education (COE), approved by the Missouri State Department of Education as an area school, and is operated by the Chillicothe R-II School District. Free tuition is available at GRTS for qualifying A+ students. Contact the GRTS financial aid office to find out how much A+ will cover for your program! Student-faculty ratio is 15-1. Many post-secondary students attend our daytime preparatory programs each year. These students come from throughout the Midwest, primarily North Central Missouri. In addition, over 1,000 area adults use these facilities for evening classes during each school year. Click here to view our most recent Placement Charts.